Need a small laptop? I mean really small? But with a real keyboard? And long battery life? Boy, do I have the computer for you. No, not a WinCE machine. It's the Poqet PC. I wanted one of these so bad, I went out and actually bought one. It's an XT clone, packed into a case the size of the larger WinCE machines. It came out in 1989, nearly a decade ago. It runs seemingly forever on just 2 AA batteries. It is a little on the slow side, but it's an impressive machine even today. It's "instant-on." Turn it on and you're right where you left off. It never really gets turned off, unless you drain the batteries all the way. You can actually type on the keyboard. I mean really touch-type. And I have fat fingers. The only problem is that after you've used the Poqet PC awhile, a normal keyboard seems way too big. (The "Q" key is way over there!) The keys have a great feel to them. WinCE machines are just catching up to this level of quality. The screen is your standard 80x25 characters. You can run it in MDA or CGA mode. CGA mode used shades of grey instead of colors, obviously. The screen is easy to read in good light, but kinda indistinct in dim lighting. Screen dimensions are about 6" x 2". It's wider for its height than many screens, making the characters a little squashed. It has your standard 640k built-in. It uses low power SRAM cards as a floppy disk replacements, up to two at a time. Standard card sized were 256k, 512k, and 1 meg. You can also use 2 meg cards with a special formatting program. One other interesting feature, you can still buy brand new units. 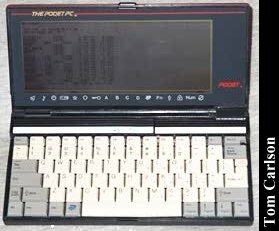 When Poqet went under, their supply of un-sold Poqet PCs went to Fujitsiu, who then sold them to California Digital. So, for $189, you can have a new one. All in all, a very, very cool piece of hardware! Click here to view all comments for the Poqet PC and to leave your own. Click here to view comments about other Poqet computers.